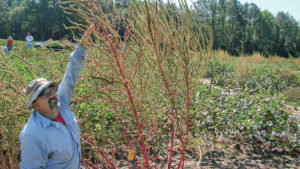 This month’s field scouting guide concentrates on Amaranthus palmeri S. Watson (Palmer amaranth). We’ve reached out to weed scientists to learn how to spot and treat this weed. Common name: Palmer amaranth is the most widely used name, but the weed also has informal common names, including palmer pigweed and carelessweed. Geographical Range: The weed is native to desert regions of northern Mexico and the southwestern U.S., including the Mississippi River Delta, Texas, Oklahoma, Kansas, Tennessee, and Missouri. The weed’s geographical range is spreading due to the accidental spread of weed seed. Crops affected: While all crops are impacted, the weed specifically targets sweet potato, corn, cotton, soybean, and all vegetable crops. It has also infiltrated some orchard crops. Brandenberger: Palmer is a big problem, particularly in crops that don’t grow to a high enough height to shade it out, which includes all agronomic crops, all vegetable crops. If it is not controlled, it will devastate most lower-growing crops. It becomes a problem at all stages, from establishment to maturity. That said, Palmer has developed resistance to glyphosate, which has rendered Roundup-ready crops not the control option it once was. 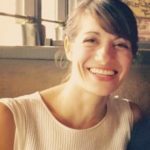 Mesgaran: It is not a major weed problem in California (yet), but it seems to be problematic in perennial cropping systems such as orchards and vineyards as well as summer crops in the San Joaquin Valley of California. It is a very competitive weed that can even grow taller than corn. In the row crop industry, studies show uncontrolled Palmer amaranth infestations can reduce yields up to 91% in field corn. There are likely similar losses in vegetable crops. 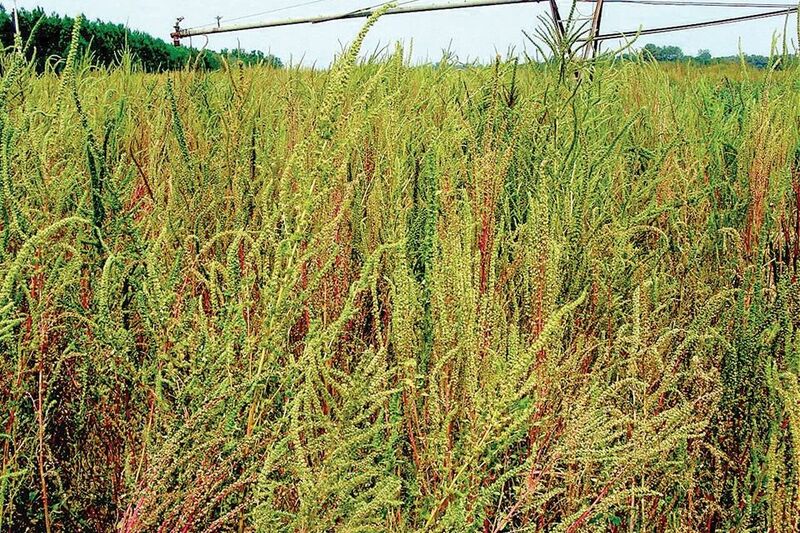 Other than yield loss, the large stature of Palmer amaranth interferes with harvesting machines, both increasing the harvest time and damaging the harvest machinery. This is particularly important in cotton, where it also reduces the quality of lint (trash in the lint). Male plants of this species produce huge amounts of pollen that may cause allergic responses. This is the late Dr. Ted Webster, weed scientist with USDA-ARS in Tifton, GA, demonstrating the height Palmer amaranth can reach. Sosnoskie: At flowering, it is most likely to be confused with waterhemp. Palmer amaranth is an erect pigweed species (growing to heights of 6 to 8 feet). The stems are hairless and range from green to red in color. Leaf shape can be variable, but most leaves are egg-, diamond-, or lance-shaped; leaves may sometimes exhibit a white or purple, chevron-shaped watermark on them. Leaf petioles (especially on older leaves) are as long or longer than the leaf blades. Flowers are primarily produced on long (up to 2 to 3 feet or more in length) and minimally branched, terminal flower spikes or on spikes that arise from upper leaf axils. Female Palmer amaranth flowers possess sharp bracts. Johnson: All pigweeds (Amaranthus species) look similar at the seedling stage. Mature Palmer amaranth is much taller (greater than 6 feet) than other pigweeds, with seedheads unbranched and a terminal spike (at the top of the plant). Palmer amaranth is also a dioecious plant, which means that there are male plants and female plants. It is worth noting that there is a significant amount of phenotypic (appearance) variation in the species, and it can be difficult to differentiate among any of the pigweed species when the weeds are young during the early season. Field history of weed infestations is important information. Mesgaran: Please note that Palmer amaranth’s two sexes remain indistinguishable until they flower. Males have soft, fluffy influence while females are rough and prickly when touched. Mesgaran: Palmer amaranth has evolved resistance to six classes of site of actions, including the most widely used herbicide, glyphosate. That leaves few options for chemical control. So integrated weed management is key to mitigation of Palmer amaranth spread. Fortunately, in California we have an integrated weed management that has been very effective in preventing Palmer amaranth invasion. The most effective management is a combination of herbicides (pre and post) and non-chemical methods such as tillage, mechanical weeding, rotation, cover crops, stale seedbed, etc. Organic herbicides such as WeedZap (45% clove oil + 45% cinnamon oil) or GreenMatch (50% lemon grass oil) are available and have been shown to control pigweeds, but they are non-selective and only post-emergent herbicides. Unfortunately, there is no organic compound known to selectively control Palmer amaranth. Brandenberger: At this point, there are some preemergence herbicides that are effective. There are also faster growing crops, such as sorghum x sudan, that can shade and out compete with this aggressive species. Treat the weed at an early growth stage (seedling) when amaranth is more susceptible. 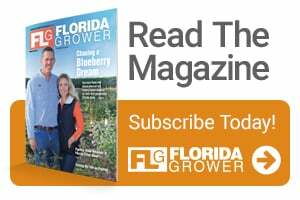 Use crops that can compete competitively with amaranth (i.e., fast-growing shading crops), and use light cultivation early in the crop season to control the weed and provide the crop a competitive advantage. Johnson: The most effective herbicides will depend on what can be used on that crop. 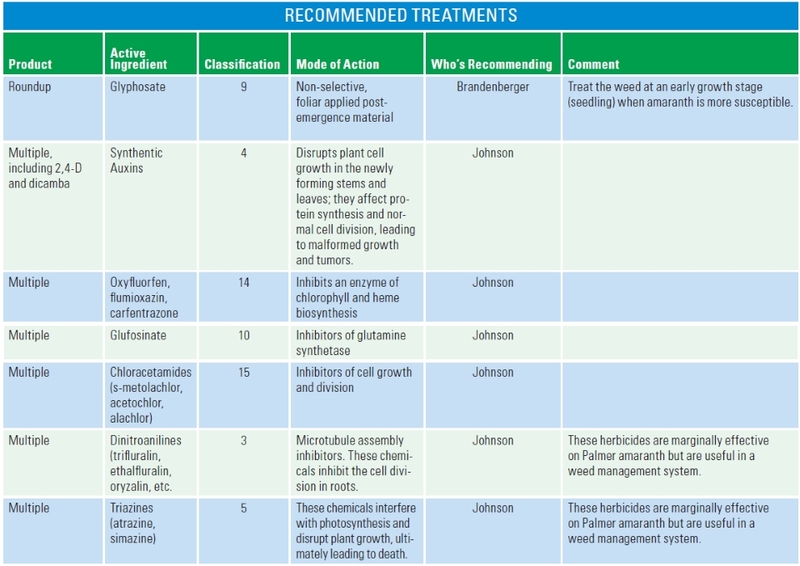 See the Recommended Treatments chart for a list. I don’t recommend the natural product herbicides (clove oil, d-limonene, vinegar, etc.) for use in any organic crop due to extreme cost and limited efficacy. Deep-turning with a moldboard plow is an effective component in managing Palmer amaranth. Since seedling Palmer amaranth is susceptible to cultivation, use a tiner weeder or sweeps. Palmer amaranth capitalizes on voids (i.e., skips) in the crop stand. Therefore, organic crops with a uniform stand is an essential component in the integrated management of Palmer amaranth. Sosnoskie: A number of factors impacts how successful your program will be, such as the current crop, which crop you plant the following field season (e.g., herbicide carryover potential), regulatory conditions that limit herbicide options, and environmental factors that could affect the timing of control measures (e.g., rainfall that impedes cultivation, the cost of control measures and the economic value of the crop, the availability of labor, etc. ).